The Department provides courses at bachelor, master and doctoral programmes. The basic course presents both traditional and modern physics, advanced courses provide students with a deeper knowledge of solids, diffusion, vacuum technology, use of plasma methods in engineering, physics of surfaces and coatings and diagnostics of surface properties. When working on their final thesis, students can develop current topics reflecting the needs of industry in the area of material sciences, nanotechnology and thermo-physical properties of substances. 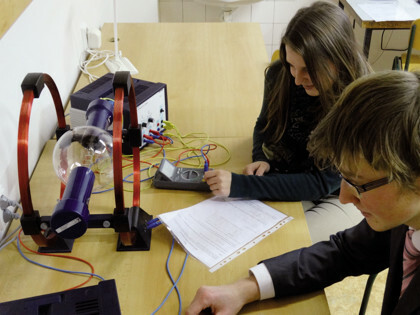 We cooperate with Czech and foreign universities (Charles University in Prague, Technical University in Liberec, University of West Bohemia in Pilsen, University of Barcelona, Petersburg State Transport University) and with departments of The Czech Academy of Sciences (Institute of Physics, J. Heyrovský Institute of Physical Chemistry, Institute of Photonics and Electronics, Nuclear Physics Institute), companies and research institutions (SAFINA a.s., Leco Instrumente Plzeň s.r.o., General University Hospital in Prague, Jozef Stefan institute in Slovenia, CERN Geneva).